We finally got something resembling a rally! No one knows the exact reason behind the huge jump, but it looks like someone got in to work early on the east coast, with a mission to take out the shorts. 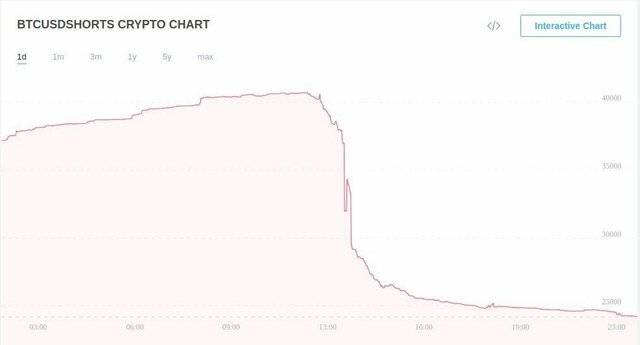 A individual, a group of individuals or perhaps Soros, decided to liquidate all the short positions that were constantly working against the market and BTC. They put in buy orders up the arse and here we are. The reason why I think it was someone on the east coast, is that it happened early enough that they would be able to monitor the effect all through the day. If in 24 hours, we are holding tight, then I am ready to say we are seeing the beginning of a bull market once again. Here is the chart of the shorts getting absolutely obliterated! !